The first Animal Crossing game released in the U.S. in 2001 let players add joy to their villager's treasure-digging and furniture-arranging lives by collecting and playing emulated Nintendo Entertainment System games. There were Nintendo games within that Nintendo game. That's not coming back, the series' creator told Kotaku. "Please consider it's not happening ever again," Nintendo's Animal Crossing boss Katsuya Eguchi recently told me through a translator during a trans-continental video-conferenced interview. In the 2001 AC, gamers could go into their homes, approach a virtual NES and start playing Balloon Fight or Donkey Kong or several other games. There have been no retro games included in the subsequent Wii and DS versions of Animal Crossing nor in this month's new 3DS game, Animal Crossing: New Leaf. "At the time, we didn't have a Virtual Console system," Eguchi said, referring to the Wii, Wii U and 3DS online shops where Nintendo now sells retro games. "We thought that playing games inside of a game is kind of funny, and we wanted to do it. But now there's a Virtual Console where you can play classic games, so we don't think we will be doing that in future titles. Obviously, Nintendo makes more money selling retro games in a Virtual Console than including them for no extra cost in an Animal Crossing. But there's another way to look at this change. Animal Crossing has never been much of a traditional video game. There aren't enemies to fight or many directed quests to go on. It's more of a play space and a realm of collecting and self-expression. The inclusion of the old NES games in the early Animal Crossing may well have been an expression of apprehension by the game's creators, a worry that players needed more "video game" in this kind of game to really care. 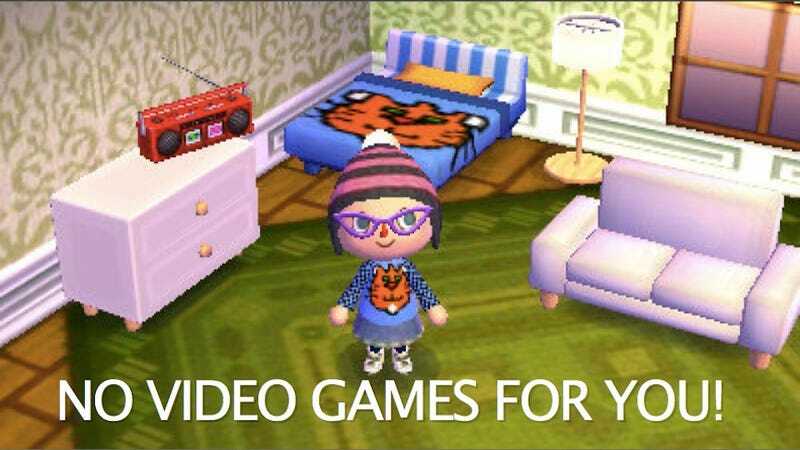 Now that Animal Crossing is a blockbuster series, it doesn't need such add-ons. People like it for the different kind of game it is. A lack of video games inside Animal Crossing also puts Nintendo in the position of implicitly endorsing the position of so many parents or anti-video game people. In the lands of our new AC villages the company is telling us to stop playing video games in our homes. They're urging us to go outside (in Animal Crossing) and make our own fun. Ah, there is one video game that would still be funny to include in future games of this series. I posed the question to Eguchi. "Would you ever at least let people play the old Animal Crossing in the new Animal Crossing games?" He laughed. "That might be interesting," he said. Let's not hold our breaths!